A grading was held in Wilkinstown Community Centre on Monday 25 Nov 2013. The examination was conduction by Mr Dave Elson and assisted by Ms. Nicola Bergin. The students testing ranged from White belt to Red belt. 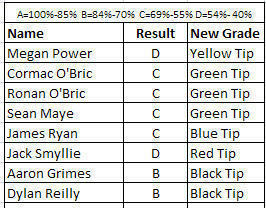 Aaron Grimes and Dylan Reilly performed very well succesfuly passing to black tip. They can now set their sights to June 2014 to train hard towards their black belt gradings!